Kickstarters are a great way to find cool and exciting projects that you can support, fund and bring to the market. There have been plenty of cool projects that have been brought to life through crowdfunding on Kickstarter. In fact, last year, we covered a list of Malaysian projects that found success on Kickstarter. One cool Malaysian project that’s currently rallying to get funded is Tiga. 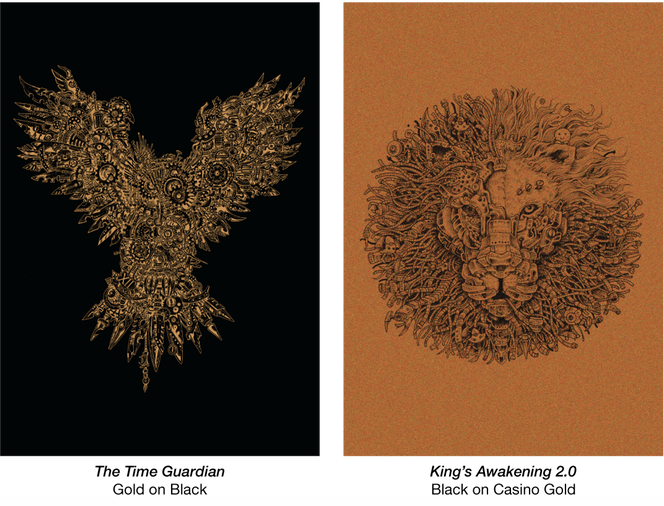 Tiga means three in the Malay language and it represents the artists’ three biggest passions—sketching/line drawings, beautiful paper, and inspirational art. 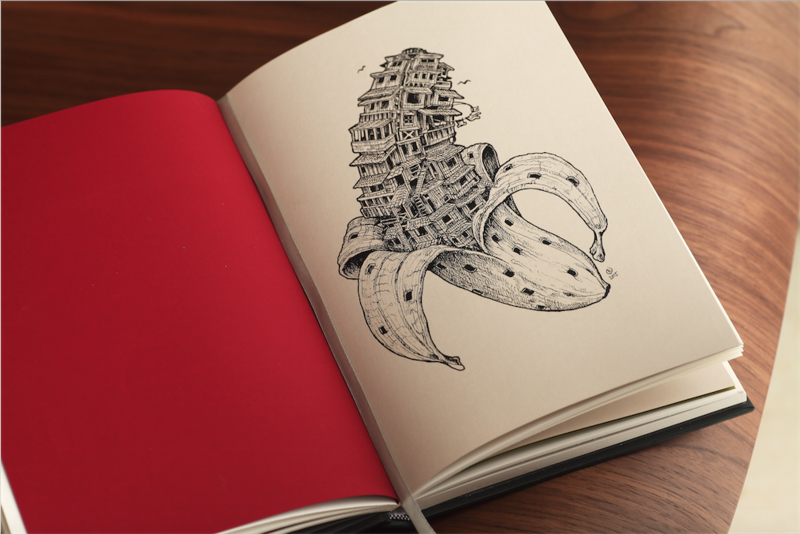 Three Southeast Asian artists Vince Low, Kerby Rosanes and Peisy Ting came together with the aim of sharing their passions with the world around them, and with that in mind they set out on a mission to create an awesome, classy and high quality sketchbook (or journal) that represents each of their individuality. The amount of effort that’s gone into putting their sketchbooks together is phenomenal. The team handpicked everything from the paper to the covers, and the design to the branding. Each of the hardcover sketchbooks is wrapped in a black cover paper from the Classy Covers line By Favini of Italy, who are the global producers of natural fibre-based packaging for the luxury and fashion industries and they were founded in 1736. Every cover has a beautiful piece of art embedded on it along with the artist’s name stamped in black foil on the spine. 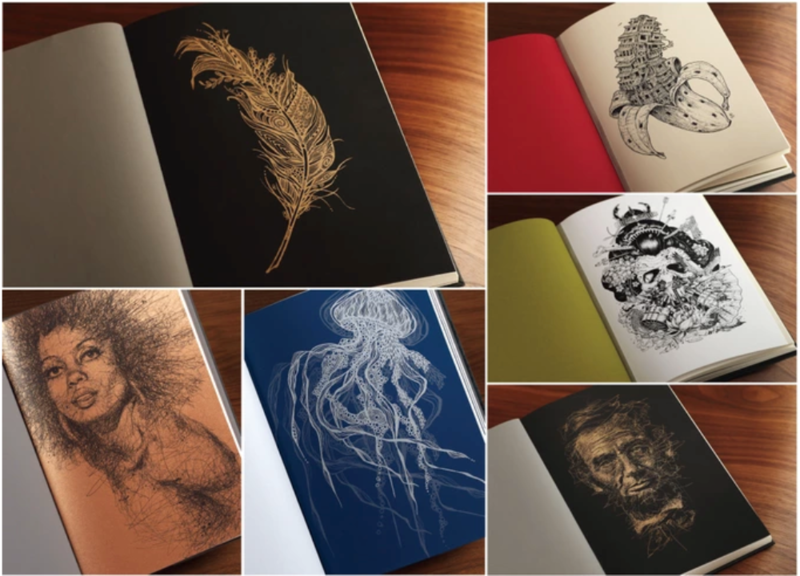 Each sketchbook also has eight amazing sketches belonging to the respective artists and it’s surely going to spark bouts of imagination and creativity within you. 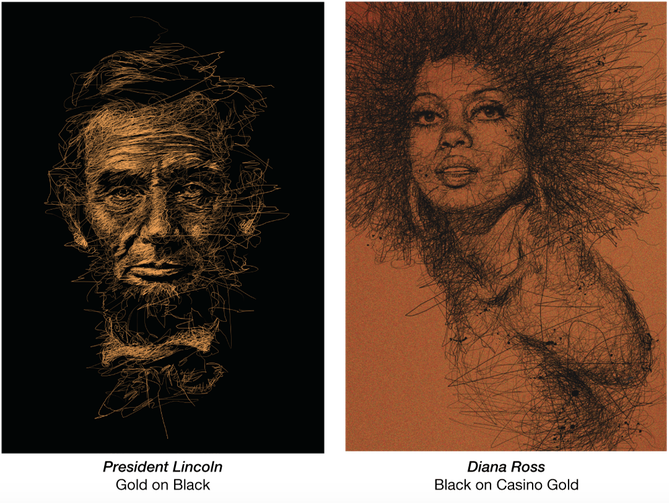 Each of the sketches is either printed in gold, black, silver or white ink on premium coloured paper—that’s also from Favini. And just like how they’ve spent hours and hours on selecting the characteristics of the cover, the team also put in a lot of thought in selecting the type of paper to be used for the blank pages, in order to ensure a high level of quality. After testing out different papers, they selected the 150gsm/100lb slightly off-white semi-coated Favini Vintage line of papers—all to ensure high quality. Artists that work with pens often don’t need to worry about feathering when they use the sketchbook. According to Peisy Ting, the products themselves are vehicles for the art and the high quality products definitely play an important part in the “value equation” and they are able to gauge that they are more than just but they are the “whole package”. Peisy Ting had difficulty with the supply of palm paper last November and she began thinking of ideas for new products. In early 2015, she began to put more effort into developing the concept of combining art and high quality paper. That’s when she began to reach out to artists who share a common passion while being uniquely talented in their field of art. She said, “I had recently completed 16 of my doodle designs for a collection of palm paper post cards and they were a big hit with people and this got me thinking about extending the line to other products such as a sketchbook and notebooks. She eventually came across both Vince Low’s and Kerby Rosanes’ artwork through blogs, Facebook shares, and through online articles and she was intrigued by their work (they both did line art). She reached out to Kerby through a friend of his who represented his work on T-shirts at a weekend market where she had a stall for her Palm Republik products, and she also reached out to Vince through one of her mutual advertising colleagues with the hope that they’d be willing to collaborate on the project. Both Kerby and Vince were more than willing to hop on the bandwagon and thus, Tiga was born. “I guess you have to really view Tiga as a team project and not any one individual which it makes it perhaps stronger over the long term. Tiga became a very fitting name as it means “three” in Malay, and obviously our team became the three of us”, Peisy exclaimed. Knowing that she’s an artist—even though she doesn’t like referring to herself as one—I wanted to know what she piece of advice she’d give someone who is trying to infuse both the worlds of art and commerce. She said, “Do what you like to do (art) and become excellent at it, and pursue opportunities where those skills are in demand (commerce) while simultaneously thinking of ways of how you can marry these two together. There are plenty of opportunities out there, but you have to be willing to take a chance and just go for it. Tiga is currently campaigning on Kickstarter with a goal of $25000 AUD. At the time of this article being written, they’ve managed to raise a total of $14, 895 AUD with 307 backers. The campaign will end on the 17th July and I can’t wait for them to reach their goal just so I can get my hands on their sketchbook. You can back them up here.